Mario Draghi ha annunciato finalmente una delle misure non convenzionali per farci uscire dal pantano della recessione: l'acquisto di ABS, il che vuol dire che, in parole povere, che la BCE acquista dalle banche i prestiti che queste hanno fatto alle aziende e in cambio gli dà euro freschi che alle banche (che non hanno … Continua a leggere Funzionerà l’ABS di Draghi? If you have no idea what this screenshot means, then your online accounts are not sufficiently protected. 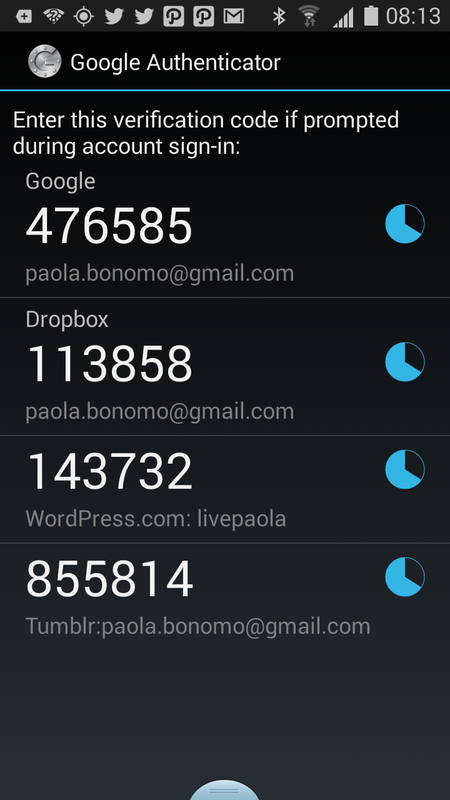 Google Authenticator is a little smartphone app (iTunes; Play Store) that you can – and should – use to ensure that whoever logs into your account on Gmail, Dropbox, Tumblr and so on not only has your username and password, but also is in physical possession of your smartphone, i.e. is most likely to be you. This is important in general, but phenomenally important for your primary email account, since whoever gets into that has a good shot at full-scale identity theft if they want to.